I love to read about EVE Online. In particular, the exploits and adventures EVE players have devised for themselves. I like a good con man story. The game's learning curve is infamously steep. Players can strike out on their own, mining asteroids, earning money, buying new ship parts, and fending off pirates - that is, other players who have discovered a more efficient route of earning money: killing weaker players and taking it. Alternatively, they can form gangs, or you might say, corporations, to combine their resources and achieve economies of scale in mining, or researching, or pirating, or hiring security to run off pirates. Or banking. Or investment firms. Or mercenary guilds. And the players do. The framework is there, and players make their own games within it. Now, when these heists go down, they don't just rob other players billions of ISK, the in-game currency, and months and years of the players' time, which is what it takes to produce the billions of ISK. ISK is also tied to real-world money, based on the exchange rate to PLEX, which are in-game items that extend a player's subscription to EVE. So, a successful player might continue playing indefinitely without having to pay his subscription fees. He might buy PLEX with ISK. And then load PLEX into his ship. And then have that ship blown up. And then the company that makes EVE laughs and laughs. Imagine: You've been collecting cans on the street, taking them into the recycling center for a few cents apiece. Eventually, you've got a whole mess of coins, so you take them to the coinstar machine. You ask the machine to convert your coins into a gift card for the supermarket where the coinstar is, so that you can buy food. You use the food to sustain your existing subscription to being alive. But then you are mugged! And the mugger takes all your gift cards for food, and runs them through an industrial strength shredder that he carries for exactly this purpose. And the grocery store that issued those gift cards laughs and laughs. Recently, pirates scored a possibly record-breaking kill of a careless pilot, destroying enough property to have let the owner keep playing for free for ~30 years. Now, that's exciting, but I call it less exciting than than a group running an enormous Ponzi scheme, or a single guy that opens a bank and then decides one day to wander off with all the deposits. Of course some players and corporations establish elaborate security plans to prevent this sort of abuse. Here's the business plan and security detail of a company called Titans4U. And here's the forum thread that contains a) people reacting to the news that the Titans4U CEO had just circumvented all the security described above and stolen everything, and b) the Titans4U CEO gloating about his caper. 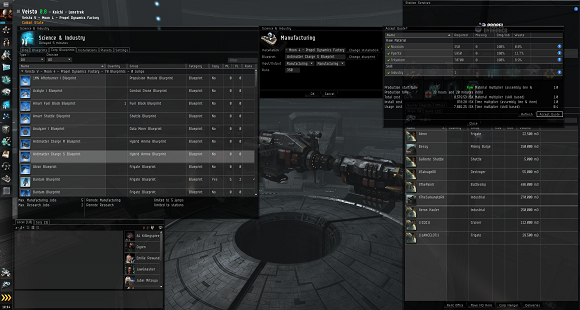 These events are among the most notorious in EVE history. In part because of the huge financial windfalls, but also because of the boldness of the players in these events. Some people pay their monthly subscription to this Massively Mulitplayer Online game to essentially work a second job, devoting dozens of hours per week to running fictional businesses. And others pay their dues and play for months, accumulating the good will and reputation it takes to defraud them. The king of EVE heists is still one of the earliest. It didn't rake in the ISK like its successors would, but the story of it must be the tale that launched a thousand software-executables-that-turn-out-to-be-mainly-screens-full-of-menus-and-spreadsheets. Bad Bobby, the aforementioned CEO of Titans4U, would call the Guiding Hand Social Club "pioneers." The club was contracted by one corporation to take down a rival. Guiding Hand members thoroughly infiltrated their target, with members taking jobs at various levels throughout the company, including as the CEO's personal bodyguard. Battles were staged and rigged to make the undercover agents look like heroes, earning them the relatively fast-tracked promotions they'd need to gain positions of power in the organization. The preparation took months. And then one day the order came down, and the sleeper agents woke up and took everything. Hangars emptied, assets seized, CEO ambushed, and her corpse delivered as a trophy to the client. There have been EVE tie-in novels. I don't know what they're about, but I like to think they're the stories of miners methodically stripping asteroids of ore, or people slowly and carefully copying sets of blueprints over a period of weeks. They ought to be about the adventures of the Guiding Hand Social Club. I originally read about GHSC in an issue of PC Gamer in 2005. Read the scans of the original article, if you dare! Humans must be shoved! Shove Pro is the answer!